Philanthropy | Red River | Technology Decisions Aren’t Black and White. Think Red. At Red River, we’re more than just a local employer. We’re an active member of the community, proudly involved in a number of philanthropic endeavors and organizations. We strive to be a good corporate citizen and to provide new opportunities for individual and community growth. 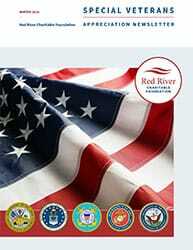 Visit the Red River Charitable Foundation for more information.